Thank you for your trust in our company and for buying the new Energy Headphones 1 Bluetooth. We hope you enjoy them. These Bluetooth headphones combine an outstanding sound experience with a modern design in fresh and youthful colours. You can answer your phone calls and control your music playback directly from your headphones. Do not expose your Energy Headphones 1 Bluetooth to impacts, dust, humidity or high temperatures. Keep the headphones clean and free of dust using a soft dry cloth. Do not disassemble your headphones. All repair works should be carried out exclusively by qualified staff of Energy Sistem Technology, S.A. Compatible with iOS, ANDROID and PC devices. Hands-free and call control functions. Control playback and volume directly from the headphones. Bluetooth version: Bluetooth 4.2, class II. Supported profiles: A2DP1.2 AVRCP1.4 HSP1.2 HFP1.6. Maximum output power: 2.01 dBm. Frequency response: 40 Hz ? 20 KHz. SPL : 109 ± 3 dB. Microphone sensitivity: -38 dB ± 3 dB. Size: 180 x 170 x 54 mm. Battery life in playback mode: 8 h.
Battery life in hands-free mode: 8 h.
USB - microUSB charging system. To turn on your device, press and hold the MULTIFUNCTION BUTTON (2) for 2 seconds and the INDICATOR (5) will start flashing blue. You will hear a confirmation sound, which means that the device is on. To turn off your device, press and hold the MULTIFUNCTION button (2) again for 4 seconds. You will hear a sound to confirm that the device is off. The INDICATOR (5) will stop flashing. When the device is on, the INDICATOR (5) will keep flashing blue. You will hear a warning sound when your headphones are about to run out of battery. This sound will be heard every few minutes until the battery is completely discharged. Connect the micro USB end of the included USB cable to the PORT TO CHARGE THE BATTERY (4) and the other USB end to any device with an USB port that can provide energy (PC, USB wall charger, car charger, etc) to charge the battery. The INDICATOR (5) will glow red. Once the battery is fully charged, the indicator will turn off. We recommend turning off the device when charging. Do not store or leave your device unused for a long period of time with an empty battery. 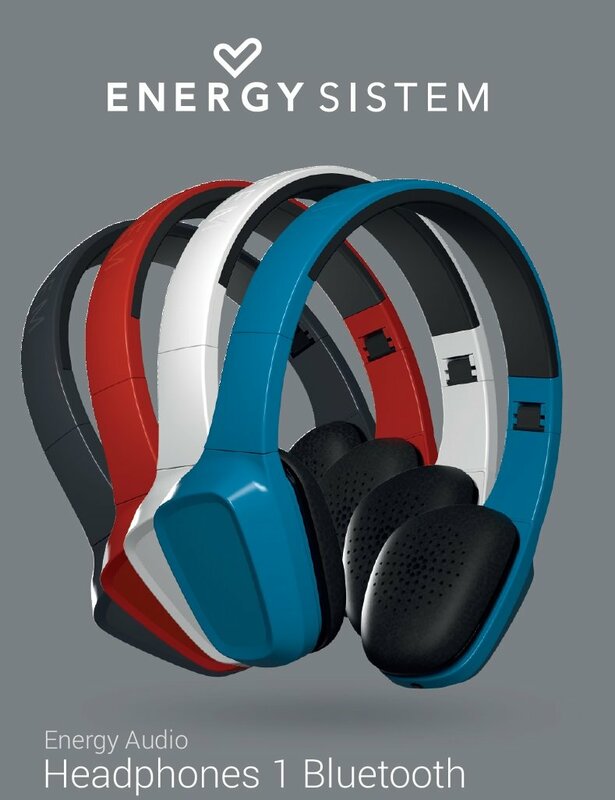 Once your Energy Headphones 1 Bluetooth are off, press and hold the MULTIFUNCTION button (2) for 4 seconds and the INDICATOR (5) will start flashing blue and red. At this point, your Energy Headphones 1 Bluetooth will be trying to pair with another Bluetooth device. Start then the search and pairing process from your Bluetooth device (smartphone, tablet, laptop, etc). Once your Energy Headphones 1 Bluetooth appear on your device screen, select "connect". The devices will be connected immediately without codes and the INDICATOR (5) will start flashing only in blue, which means that the device is on and has been correctly paired. Your Energy Headphones 1 Bluetooth will automatically turn off after 10 minutes if they are in Bluetooth mode and not synchronized with any device. Once your Energy Headphones 1 Bluetooth are paired, you can control basic playback functions such as turning up and down the volume, switching to the next or previous song and pausing and resuming playback directly from your headphones. Press and hold the NEXT button (1) to switch to the next song. You can also press and hold the BACK button (3) to switch to the previous song. Press the VOLUME + (1) and VOLUME - (3) buttons to turn up and down the volume respectively. You will hear a beep when reaching the maximum volume level. Press the MULTIFUNCTION button (2) once to pause or resume playback. Your Energy Headphones 1 Bluetooth will automatically turn off if you pause playback for more than 10 minutes in order to save battery. In addition to all modes explained so far, you can also connect your Energy Headphones 1 Bluetooth to your music player through the included audio cable if you run out of battery or simply do not want to use the wireless connection. Turn off your Energy Headphones 1 Bluetooth and connect your cable to the AUDIO-IN (7) to use this mode. NOTE: Playback control function is not supported in this mode. Therefore, you will have to use the player connected to your headphones to turn up and down the volume, switch to another song or pause playback. 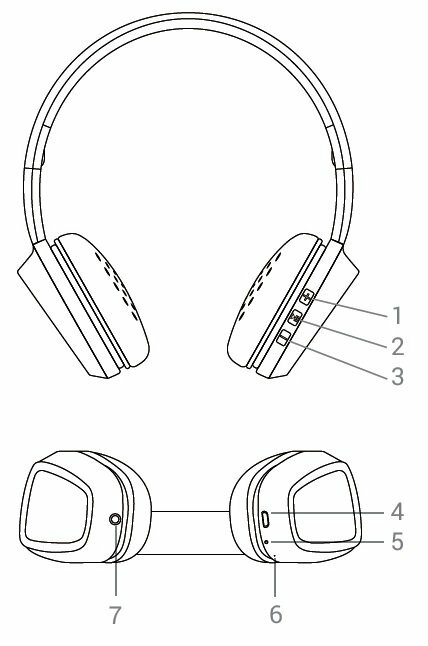 Once your Energy Headphones 1 Bluetooth and smartphone are synchronized, you will be able to receive calls and use the MICROPHONE (6) to talk while you wear them. Use the MULTIFUNCTION button (2) to answer an incoming call. If you are listening to music when you receive a call, playback will pause and you will hear an incoming call sound. You can also press and hold this button for 2 seconds to reject an incoming call. Press the MULTIFUNCTION button (2) again to end a call. Playback will resume from the point it has been interrupted. You can also press twice the MULTIFUNCTION button (2) while you are listening to music to dial the last telephone number in your smartphone's call log. Energy Sistem Technology, S.A. is liable for any lack of conformity that exists at the time the goods are purchased during a period of 36 months. Batteries are excluded from the 36 month warranty, having a warranty period of 12 months. ©2017 by Energy Sistem®. All rights reserved.